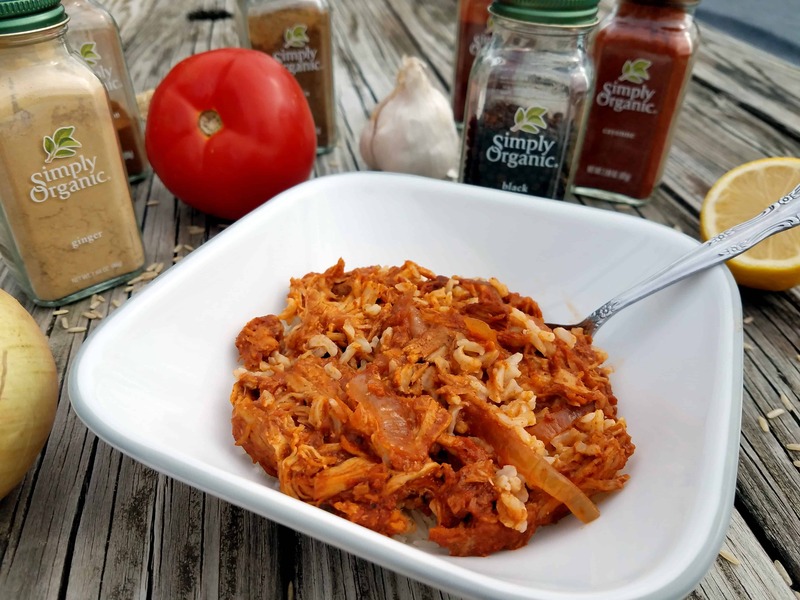 This slow cooker butter chicken is simple to make, yet full of flavor! Serve over some brown or jasmine rice, and pair with some Naan. In a small bowl, combine all the ingredients for the marinade, except for the chicken breasts. Mix with a spoon until combined. Transfer marinade mixture to a gallon size ziploc, and add the chicken breasts. NOTE: It’s ok if the chicken is frozen. Zip the bag closed, and work the mixture into/over the chicken until the marinade is all incorporated. Refrigerate overnight. When you are ready to cook the chicken, add all of the sauce ingredients to a slow cooker. Stir to combine. Scrape off a majority of the marinade from the chicken and discard. Add the chicken breasts to the slow cooker, and spoon the sauce over the chicken to cover it. Top with sliced onions. Transfer chicken breasts to a plate, and shred with two forks. 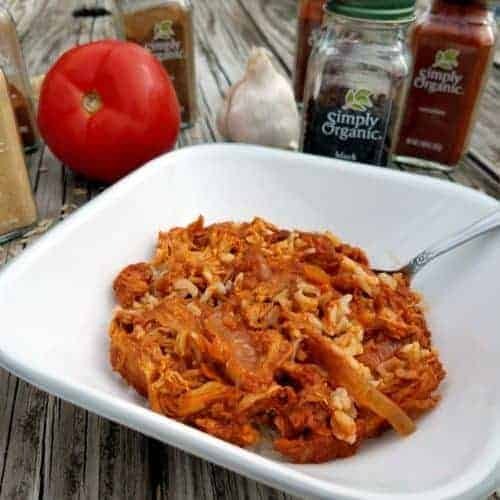 Return shredded chicken to slow cooker. Stir the cornstarch into the water slowly. This ratio actually produces Oobleck, which acts like a solid when stirred quickly, liquid when stirred slowly. Pour mixture into slow cooker and mix until incorporated. Serve over brown or jasmine rice. I would also highly recommend eating the dish with some Naan. Credit: Recipe adapted from Sabrina at Dinner Then Dessert. Oh, that is making me feel hungry… I should try to cook that, it looks really tasty! I have never had this before but would love to try it! Thank you for sharing the recipe, I’ll have to try making this soon. 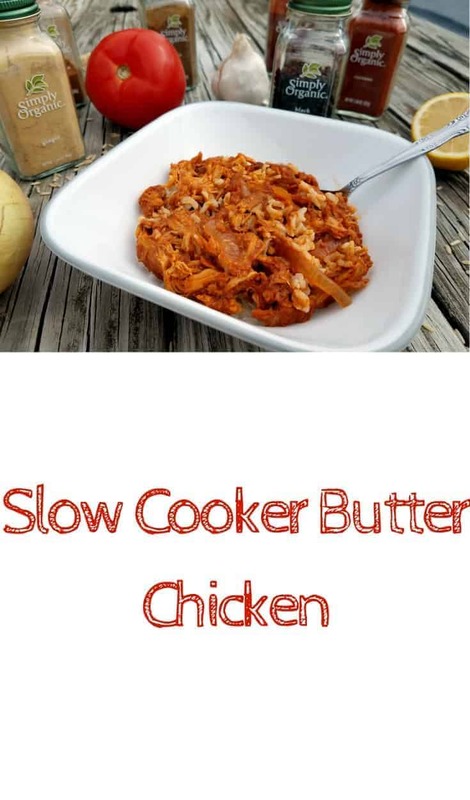 I’m always on the lookout for more slow cooker chicken recipes. This one looks soooo tasty. Thanks for sharing the recipe. We love chicken dishes and we also love Indian flavor in our dishes. This is one recipe that looks like it would make it to our file. It is always nice when a recipe is shared and not only the result. This looks great and tasty. Although i haven’t had butter chicken in a while now. Oh this sounds delicious! We broke out the slow cooker yesterday for the first time in a while, it felt like autumn had arrived! This is perfect for a weekend meal! My whole family is coming over this weekend, and I’ll definitely use this recipe. Thanks! I’ve never had this recipe before but I am looking forward to trying it. I’ve been looking for some more slow cooker recipes to try out.